Successfully Added Wall Climbing RC Toy - Spider to your Shopping Cart. Get ready for the anti gravity wall climbing RC SPIDER Toy. It Spider shape & looks will certainly turn a few heads. This Spider wall climbing RC toy can be driven on walls and ceilings and makes for an amazing Halloween gift or decoration as well as a novelty gift for anyone. 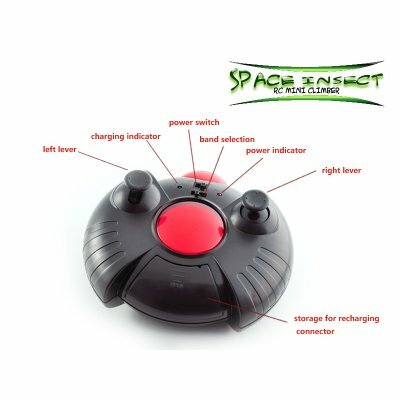 The Spider RC toy runs off a rechargeable internal battery that can be charge via the IR remote controller. The IR remote control runs off 6 AA batteries (Not Included), along with two joy stick controls for versatile maneuverability that gives the Spider the naturalistic maneuvering features that makes it special. If you enjoy practical jokes, then you definitely need to get this Wall climbing RC Spider. Picture this, place the RC spider away from sight behind a vase on your coffee table for example, and wait for a friend or family member to sit down before activating it, the rest is left to your imagination. To consume battery power, the wall climbing RC Spider comes with two mode functions. Turn the switch right to the (W) sign, and the suction will activate which enables the Spider RC toy to defy gravity and stick to walls and ceilings. Alternatively, you can turn the switch left and use this function when only operating the RC toy on floor. If you're in the market for a great resale item, or simply looking around for a great RC toy, then look no further. This is the Wall Climbing RC toy you have been searching for. Go ahead and click "Add to Cart" now and we'll express ship you a sample straight away. This extra cool Anti gravity RC toy is brought to you by the leaders in factory direct wholesale electronics, Chinavasion. Note: This great new product is with factory direct low china wholesale price . It is stocked in our warehouse for immediate order fulfillment and worldwide shipping to any destination whether it's you or your customer..
Do you think this would be a good product to resell to others? We suggest you visit our article titled "eBay Alternatives - Where Else Can You Sell?" (URL = http://www.chinavasion.com/ebay_alternatives.html) to get an idea of where online you can resell this item. How can this Wall Climbing RC Toy possibly drive on walls and ceilings? Fabric skirts and a powerful fan create suction that lets the RC Spider drive along walls and ceilings. Will this RC Spider work on the walls of my home / office / dorm? This Wall Climbing RC Spider Toy works best on flat, clean, uninterrupted surfaces. NICE JOB WITH THE SPIDER...I WOULD LIKE A MOUSE THOUGH .....YOU GUYS SHOULD MAKE ONE YOULL SELL MORE SPECIALLY IN THE UNITED STATES EVERY SCARED OF MICE. JAJAJAJA I WOULD HAVE LOTS OF FUN WITH IT.